My name is Samir shah having 9 years experience in Pharma companies. I have worked in production department, green projects setup, qualification activities, SOP preparation and system establishment in company. Dear sir i am guruprasad i am science graduate having 15 yrs experience in quality control and audit and compliance i am interested to work in dubai please provide opportunity guruprasadpatwari@gmail.com 8951372184. I am b. Pharmacy graduate recently passed out. 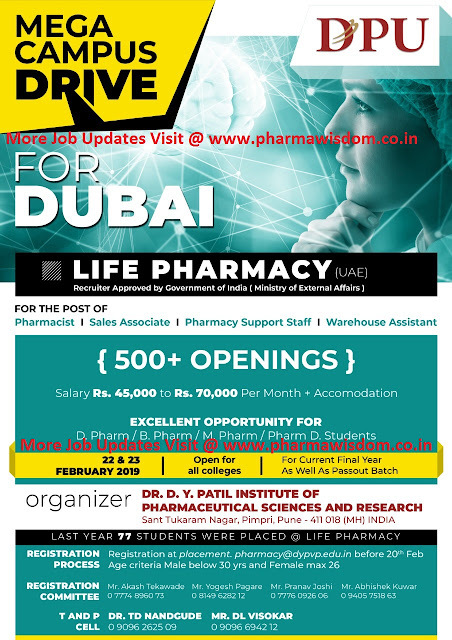 I am interested to work as pharmacist in UAE. Please provide me with this opportunity. I'm Mukesh Kumar BBA with Fresher. Sir I am a d pharm certificate holder and best experience in generic medicine + standard medicine 2 year experience .